An absolute delight for any sewer, the impressive Brother Innov-IS 1300 is fabulous for quilting with its long arm and smooth operation. A great range of built-in stitches and a raft of useful features make this machine an outstanding choice. The Brother Innov-IS 1300 features 182 built-in stitches and so there is something for everyone. The utility stitches and decorative stitches are joined by 10 styles of automatic one step buttonhole and 5 fonts with upper and lower case. Stitch length and stitch width are adjustable and you can create, combine and memorise stitches. Stitch selection is easy with the touch sensitive buttons and you have a drop feed facility for free motion sewing. This machine also offers a quick set drop in bobbin and automatic needle threader so you can set-up and start sewing quickly. The automatic thread cutter trims your upper and lower threads at the touch of a button and the start/stop function means that you can sew without using the foot controller. You have speed control to help you tackle intricate work, a lock stitch function and a knee lift so you can keep both hands on your work. The Square Feed Drive System (SFDS) ensures that fabrics of all thicknesses feed well and the stitch quality is always maintained. This machine also enables multi-directional sewing as it has a sideways feed. 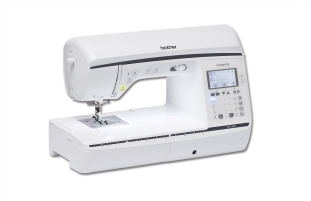 The Brother Innov-IS 1300 is the complete sewing machine and will enable you to make the most of your hobby.